Show your love for Jack Herer everyday through vape with this limited edition, custom Hot Box Vaporizer! The Hot Box is a multipurpose inhalation vaporizer designed to not only enhance your herbal vaporizing experience but keep it dead simple as well. The Hot Box is as simple and effective as you can get and a healthier alternative to conventional methods. Hot Box Vaporizers are designed with a highly engineered ceramic nichrome heating element which allows the Hot Box Vaporizer to heat-up and sustain its optimal temperature more efficiently and remain inert unlike cheaper vaporizers. Each Hot Box Vaporizer comes complete with Tile Hot Box, Glass Wand, Tubing, Screens, Sticker and Instructions and all covered with a 2 Year Warranty. Dimensions are a very compact 6" x 6" x 6" cube. 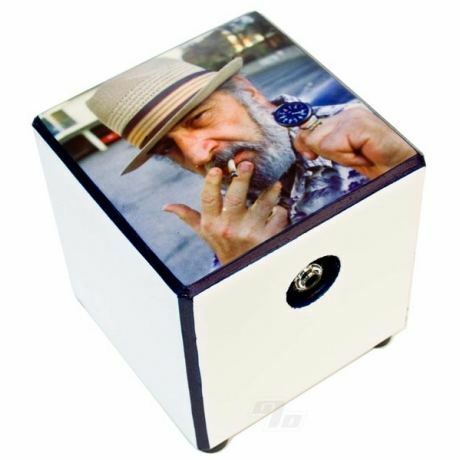 With a 2 year no hassle warranty on each Hot Box Vaporizer you can rest assured that your receiving a quality vaporizer made and tested in the USA. If you experienced a problem outside of the 2 year warranty, then you can still have your unit refurbished for a small charge. Please Note: 110V US/Canadian plug. Contact us for a 220v version.